During his fabulous playing career, Jimmy stood for everything that was good and best about the Beautiful Game. He had silken skill, incredible ball control, arguably the greatest finishing ability of any player of his generation and, most important of all, he always played with dignity, style and sportsmanship. And this is what the Jimmy Greaves Academy is determined and dedicated to passing on to its members: the Greavsie character and attitude. It was Jimmy’s dream to launch an Academy where he could teach young footballers to get the most out of the Beautiful Game, without breaking the bank or bankrupting their parents.He believes – as does the Academy – that this it is the people’s game, and nothing to do with the depth of a person’s pocket. He and his son, Danny – also a former professional footballer – often discussed how to introduce an Academy here on the playing fields of Essex, where he took his first shots on the way to world fame. Sadly, just as plans were evolving, Jimmy was the victim of a paralysing stroke, but he has made it clear to Danny that he wants the plans they agreed on to still be put into operation. Jimmy lends his name to the Academy, and the essence of what we will be trying to achieve is driven by standards that he set in a career that earned him the hero worship of football supporters and the respect from his peers at club and country level. For the generation that only knows of him as a television celebrity, just let’s say that when you are watching Lionel Messi, it is like an action replay of Jimmy at his best. The way Messi runs at defences (cunning running, Jimmy would call it), the way he changes pace and direction, and above all the way he finishes – passing the ball into the net – is pure Greavsie. The close control is identical, the sudden acceleration, the ability to shoot with either foot, the same low gravity and perfect balance. It’s all a flashback to “Our Jim”, who scored a record 357 “old” First Division goals. Messi has amassed nearly as many, but without violent interruption from defenders like Ron “Chopper” Harris and Norman “Bites Yer Legs” Hunter. Youngsters should ask their parents about these beasts of the game who were allowed to tackle from behind and to be physical in a way that would today earn instant red cards. And remember, Jim used to play on what were ploughed fields compared with the snooker table surfaces the Premier League footballers enjoy today. Jimmy’s most dazzling goals came when he was wearing a Chelsea shirt and playing with the gay abandon of youth (“gay” had an innocent connotation in those black and white days). Sadly, few of his Chelsea crackers were captured on film or tape, but ask anybody who was around at the time and they will confirm that many of them were magical. There is, understandably, Messianic fervour about Messi, who earns in a single week more than Jimmy earned throughout his career! Jimmy did not just decorate games, he decided them. Time and again he would pop up with the winning goal, just as his markers were congratulating themselves on shutting him out. His output for England was 44 goals in 57 international matches, five short of what was then Bobby Charlton’s record of 49 goals. Sir Bobby’s total was achieved in 106 games. 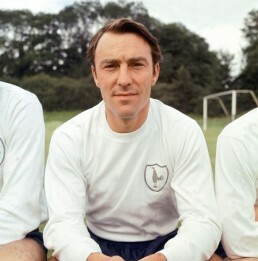 He became a national treasure, and it is our privilege to be able to use his name: The Jimmy Greaves Football Academy. Join us and catch the Greavsie knack of playing with a smile on your face.